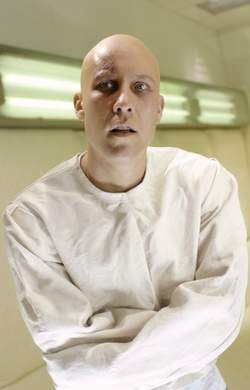 Opposite: Michael Rosenbaum as Lex Luthor in TV's Smallville. When DC Comics gave Jerry Siegel and Joe Shuster's archetypal hero Superman a hitherto unrevealed career as an adolescent crime fighter in More Fun Comics #101 (1944), the character's boyhood town of Smallville had produced few memorable, bona fide supervillains other than mainstay arch-rival Lex Luthor. In the WB network's popular teen drama Smallville (2001–present), however, adversaries of the Last Son of Krypton are legion. Smallville's eponymous Kansas farm town—the boyhood home of Clark Kent—has been portrayed on the large and small screen before—in short “Superboy” animated features made for The New Adventures of Superman (1966–1970), in Richard Donner's 1978 feature Superman: The Movie, in Richard Lester's 1983 sequel Superman III, in the 1988–1992 Superboy syndicated television series, and in ABC's Lois & Clark: The New Adventures of Superman (1993–1997)—but no previous television or film drama has ever examined the town and its denizens, superpowered or otherwise, in such indepth fashion. Powerful villains abound in Smallville, though most possess no superhuman abilities. These include: Lionel Luthor (cast regular John Glover), the ruthless head of LuthorCorp who murdered his parents to gain access to their fortune; Morgan Edge (played by guest stars Rutger Hauer in “Exile” and Patrick Bergin in “Shattered”), an equally cutthroat Metropolis crimelord with a keen interest in young Clark Kent's amazing Kryptonian abilities; Lex Luthor (series regular Michael Rosenbaum), the ne'er-do-well twentysomething son and successor of Lionel Luthor, who engineers the downfall of his hated father, befriends the teenage Clark Kent for ambiguous and perhaps cynical purposes, appears to be a high-tech/corporate supervillain in training as well as a future U.S. president—and may thereby bring about the apocalypse; and Jor-El, Clark Kent's superpowered Kryptonian father, a disembodied presence who visited Earth some forty years earlier and now tries to force Kal-El to conquer and rule Earth (“Phoenix”; “1961”; “Velocity”; “Legacy”; “Covenant”; “Commencement”). In 2005 the super-intelligent Brainiac, in the person of Clark Kent's college professor Milton Fine (portrayed by James Marsters, who played the ambiguously noble vampire Spike on Buffy the Vampire Slayer and Angel), joined the ever-expanding rogues' gallery of Smallville's proto- Superman. Then come the other, far-more-ubiquitous Smallville villains, those who owe their suddenly superpowered existence to the shower of green meteors that devastated the town in 1989. The glowing green kryptonite rocks deposited across Smallville that day constitute the mortal remains of the shattered homeworld of young Kal-El/Clark Kent (played with superb heroic innocence by Tom Welling), whose small spaceship not coincidentally landed in a Smallville cornfield that same day. Those phosphorescent meteor fragments also fuel the all-but-routine supervillainy that proliferates in present-day Smallville; it is no small irony that the same distant, doomed planet that birthed the teen who will be Superman also spawns new adversaries for him on an almost weekly basis some sixteen years later. Although green kryptonite can kill Kent—the far rarer red variety merely turns him into a brutal, narcissistic teen delinquent (“Red”; “Rush”; “Exile”; “Unsafe”)—exposure to the alien material's mutagenic radiation can confer superhuman abilities of various sorts upon ordinary humans, many of whom are adolescents. Indeed, kryptonite- mediated teen metamorphoses are arguably allegorical references to the anxiety stemming from the rapid physical and emotional changes experienced by high school kids. In a nod to the pitfalls of puberty, so many of these kryptonite-powered people prove to be irresponsible with their newfound gifts—powers that include controlling swarms of insects (“Metamorphosis”; “Drone”), telekinesis (“Crush”), teleportation (“Obsession”; “Unsafe”; “Pariah”), the ability to manipulate the laws of probability (“Jinx”) and emotions (“Magnetic”), and even the power to turn sexually het-up adolescent boys into hormonecrazed assassins (“Heat”)—that Smallville High's student newspaper editor Chloe Sullivan (Allison Mack) has enshrined stories about them on a “Wall of Weird.” Smallville's most serious weakness may be that format and continuity demand that most of Clark Kent's adversaries—especially those who witness him using his powers—must share one of two possible fates: death or amnesia. Were it otherwise, the (mostly) well-kept secret of Clark's superhuman abilities and extraterrestrial origins would doubtless spread far and wide, thereby ruining the destiny that must someday lead Smallville's callow young Kent to become the protector of Metropolis and the world. In a modern example of comics imitating live-action imitating comics, Smallville's kryptonite-generated villains—along with the likenesses of the show's cast—have spilled back onto DC's sequential art pages in a Smallville comic-book series (2003–2005) that featured original stories by writer Mark Verheiden (author of numerous Smallville television scripts). Meanwhile, Smallville's pageant of kryptonite-powered villains continues. In the pages of the early 1970s comics, every chunk of kryptonite on Earth was once destroyed, a development that turned out to be only temporary. In Smallville, only another such unlikely eventuality seems capable of stemming the tide of emergent small-town supervillainy.